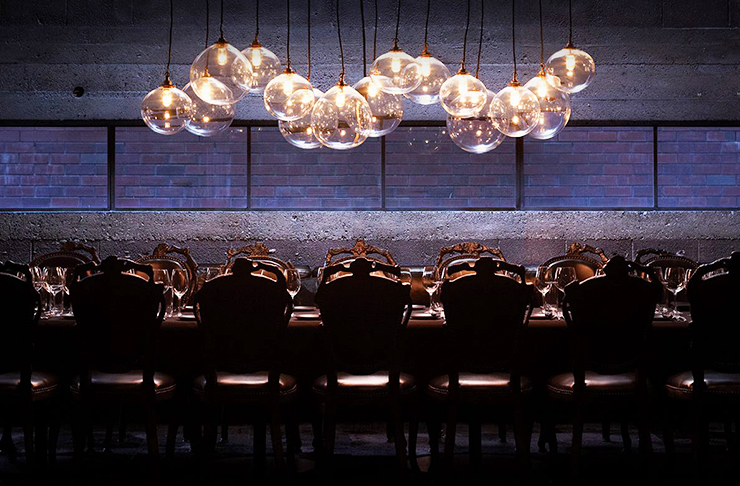 Here at The Urban List we are alllll over a venue that offers private dining. Because why host your own shindig when you can have someone else cook for you (and clean up after)? Whether you're planning a big function, a small get together for a few friends or an intimate dinner for your significant other, these Auckland private dining rooms have got you covered. What a perfect way to make your event a little bit extra by throwing in a private chef and some catering at a super lush Auckland private dining room. Throwing a party has never been easier. The Governor eatery serves up a delicious menu filled with simple, fresh and seasonal dishes, created by chef Sam Campbell. The Private Room seats up to 25 people (if you’re wanting one long table you’ll need to cut this number, or get creative). It's an intimate venue for dinners, baby showers or sporting events any time of the day. The calming vibe, accessible meals and TV create a functional yet relaxed atmosphere. Decorated in vintage kimonos, the Obi room is a private dining room partitioned by bubble glass from Masu’s public restaurant. Home to a five-metre-long Suar wood table, the private space seats 18 and has an elegant, exclusive vibe while still embracing the action of the restaurant. Every Sunday, The Obi Room is transformed into a kid’s play room for the brunch seating. If you’ve got some munchkins, you can enjoy Masu’s brunch experience in the main restaurant, while they play with the toys, watch DVDs and enjoy a bento box that’s been specifically created for the younger crowd. Renowned for providing Aucklanders with some of the tastiest Russian eats, little did you know that Vodka Room has a private ballroom, closed off to the public. The dimly lit area has the capacity to hold 70 people and you and your guests get to enjoy canapes, personal cocktail bartender and a three-course dining experience. This highly exclusive and luxurious ballroom is one of Auckland's best-kept secrets and is only available upon request. The private dining room at The Grill is an elegant hideaway that’s hosted the likes of Justin Bieber and Pink Floyd. Located upstairs from the restaurant, the space seats 20 and is the perfect spot for devouring succulent meats in privacy (but don’t get all caveman on it, table manners are still a must). The room is fully equipped with all the tech gear to support business meetings, and if you can work out a way to expense the experience, you’re winning at life. 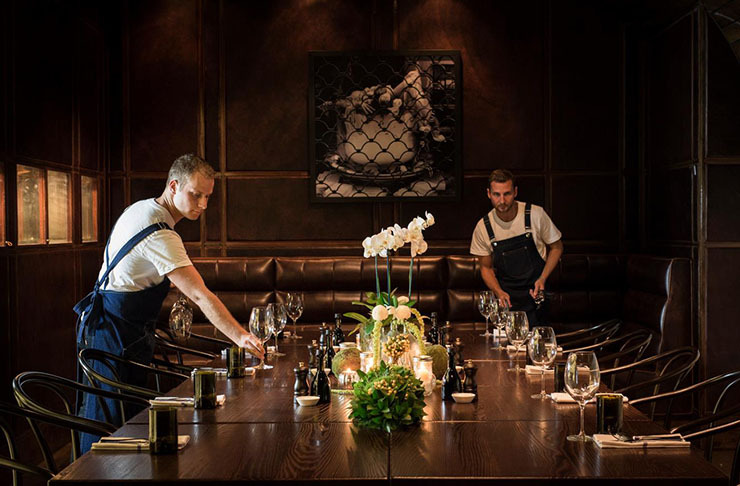 Boasting one of Auckland’s largest private dining rooms, Sean Connolly’s restaurant, Gusto at The Grand is the go-to for end of year and larger functions that don’t compromise on taste. The menu features Italian fare that’s designed to be shared, family style. All you need now is 27 other carb-loving mates and you’ve got yourself one heck of a party. Located on the 53rd floor of the Sky Tower sits the Sugar Club—Peter Gordon’s restaurant is well-known for its drool-worthy food and jaw-dropping views. The private dining room is separated from the main dining area but is only partly partitioned, so you can enjoy the hustle and bustle of the restaurant without being amongst it. The room seats 12, with menus changing seasonally. Tucked away on Fort Lane is Cassia, the contemporary Indian restaurant from seasoned restaurateur Sid Sahrawat of Sidart in Ponsonby. 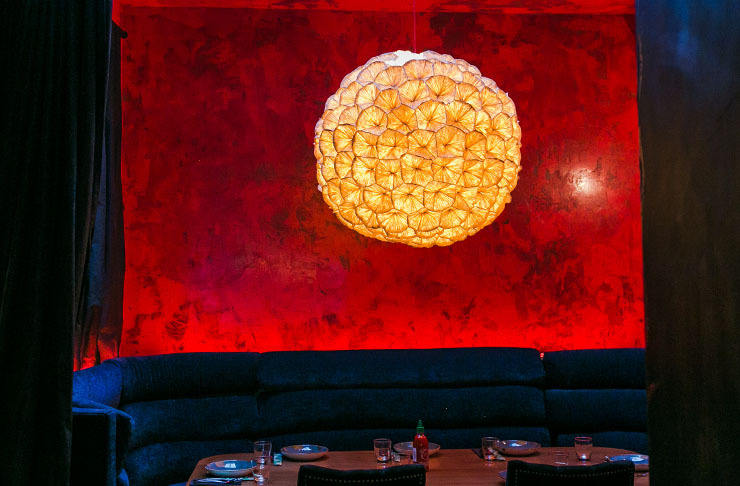 Since opening in 2014, Cassia has won the hearts of Auckland diners and offers both a 16-seater semi-private dining room (A.K.A the Holi room, after the colourful Indian spring festival), as well as a fully private dining room which seats up to 20 people. The sleek interiors complement the modern menu to create a lively experience that suits both corporate and personal functions. Located in Eden Terrace is one of the top fine dining institutions of Auckland where there's a constantly changing menu to ensure freshness in produce and best quality. The degustation meals at The French Cafe have so many different elements and are best enjoyed in their private dining area - The French Kitchen. This is where you and the chef can have an intimate table experience and each element and flavour can be explained so you find a new level of appreciation for the plate of beauty. Private dining areas don't always have to be upscale and fancy to be an enjoyable and special experience. Orphans Kitchen in Ponosnby has a private area that is available on request and it has a vibe of warmth and intimacy like no other, The rustic wooden floors, plain white walls and lighting with strong yellow hues makes you feel welcomed. Orphans also have a menu that utilises the best of the best ingredients and they put love and care to every element of the dish, making it a favourite for many Aucklanders. From the creators of Xuxu Dumpling Bar and Cafe Hanoi is an eatery that serves up authentic Thai cuisine called Saan Restaurant. Think outside the norms of Pad Thai and think grilled fish on perilla leaf instead. Saan is a dimly lit restaurant that has a romantic and cosy ambience. They have a private dining area that seats up to 20 people and is a rising location for all foodies in Auckland. If you’ve ever been to Café Hanoi you’d be surprised to hear they have a private room tucked away that seats up to 20 people—but that’s what’s so great about it. Located downstairs from the restaurant, private dining guests can escape the Britomart bustle and experience The Parlour is a lovely space, with its exposed brickwork, wooden beams and a private bar. It's well suited to both cocktail parties and food-based events, with Head Chef Jason van Dorsten on-hand to whip up a unique banquet menu or some yummy canapés for standing guests (you can fit an extra 10 people in this way). Situated in the historic General Buildings is a fine dining restaurant that represents sophistication and class, otherwise known as Wine Chambers. Only ever using the finest of seasonal ingredients and top notch service, they have not one but two private dining rooms that hold different capacities. The rooms hold up to 20 people and a white colour scheme to enhance the pristine environment. Wine Chambers quaint ambience has made it one of the most popular eateries to hold intimate events such as engagement dinners and small weddings. Clooney was at the forefront of the fine dining trend in Auckland, and needless to say us Kiwis have taken to it with abundance. In 2014, Clooney opened their exclusive Dom Perignon Basement Room. The room works with up to 18 people and takes the ‘chef’s table’ concept into play allowing guests to watch executive chef Des Harris and his team perform their culinary magic. There’s a semi-private dining area upstairs which works for a smaller crowd of up to 14 diners. Cibo is one of Auckland’s best-kept secrets. Serving those “in the know” for over 20 years. This swanky restaurant is open for lunch Monday through Friday and dinner Monday through Saturday, with an option of an A La Carte menu, degustation, express or set menu. 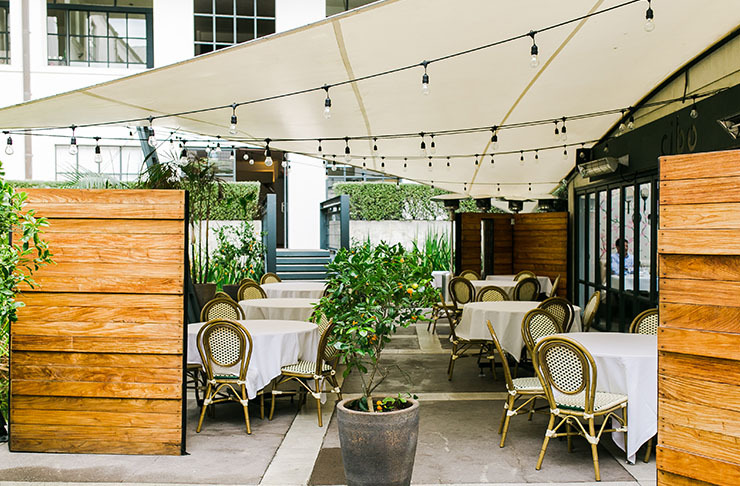 Cibo has hosted many exclusive functions in their courtyard area, which can be hired out for private dining, serving up to 120 guests, with inside seating up to 80 guests— the perfect venue for an intimate wedding reception. The private courtyard area even boasts a fishpond, to make your special event a calming and tranquil space for your guests to enjoy while they sip on some bubbly. This super trendy Southeast Asian fusion restaurant makes dining out super fun with their delicious selection of sharing plates. Not fussed on sorting through the vast menu yourself? Not a problem! Just say “let’s eat” and they’ll serve you up a selection of their favourite dishes for just $65 pp, with gluten free, vegetarian and seafood-free options. And if you’re feeling like something a little bit more intimate, then they have three exclusive private dining rooms for hire. Choose between the Opium den, which seats 8-10 people in booths, Ms. M’s which seats 8-12 people with a roaring fireplace to warm you during the winter months, and the function room, which seats 30 people for those bigger parties.